The world as you know it is a lie. We are not alone and they are influencing us now. An alien race known as the Shapers have released Exotic Matter (XM) in order to manipulate human evolution — to what purpose, we do not know. But now we know of their existence and we have stolen their technology. With it, we can establish control fields to shield the minds of humanity and save the human race from shaper tampering. We are the Resistance. Be wary, however. There are people who have already been controlled by the shapers. They want the shapers to control who and what we become. They fear our individuality. They believe they are enlightened. We must stop them from creating control fields that influence our fellow man. They are a misguided people. “Ingress” is an Augmented Reality game played on a smart phone and set in the real world. XM Portals are created by agents at various points of interest (murals, government buildings, sculptures, places of significant historical interest, etc.). These portals are keys to the fight between the two sides. Each side tries to claim them and use them to create fields. The game, created by the Niantic Project, is the brainchild of Google. It was designed to get people out from behind their computers and gaming consoles, and into the real world again. It encourages travel to new places and walking. I highly encourage anyone and everyone with a smart phone of either the Android or iOS variety to play the game. Both sides have really good people who are willing to help you get started. Start claiming portals and start walking. OCCC is home to 16 portals at this moment and there are hundreds all over the city in places like Bricktown, the Oklahoma State Capitol and History Museum, the zoo, Edmond’s Old Town on Broadway, OU Health Sciences Center and main campus, and the 45th Infantry Museum. 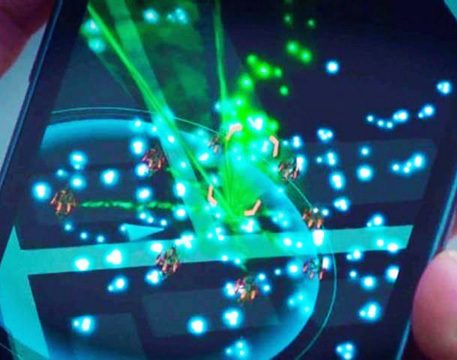 “Ingress” is available at the Google Play and Apple stores on each device respectively. For more information, check www.ingress.com.